Jason Saves the World: I Made It to Berlin! 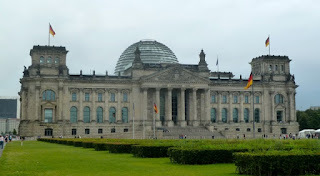 I arrived in Berlin around 8:30pm. Christoph, my rideshare, drove me to Spandau. I got a ticket and sat on the S-Bahn. A couple stops in, at Olympia-stadion, a huge crowd of people boarded the train. They had seemingly just come from a football match (FC Hertha). I soon got to Zoologischer Garten and walked over to the U-Bahn and arrived at my destination neighborhood soon thereafter. I was a bit confused by the street numbering - instead of going odd-even across from each other, the numbers went up one side of the street and down the other. The first night in Berlin was quiet; after dropping my stuff off, Felix and I simply got some beers and chilled inside. This day, Thursday, Felix had work early, so he left before I woke up. I didn't leave the apartment until after noon, when I walked all the way to the Reichstag and tried to figure out how to buy a one-month transit pass. Frustratingly, none of the ticket machines were accepting credit cards (I'd soon discover that, even more frustratingly, few places in Germany accept credit cards). The weather had clouded up and it began to shower. The streets were soggy as I met Felix after work in Kreuzberg. It's a really cool neighborhood, funky, cheap, diverse, and artistic - definitely the kind of place I like in a city. We walked around and had some Thai food, which wasn't bad and pretty cheap. 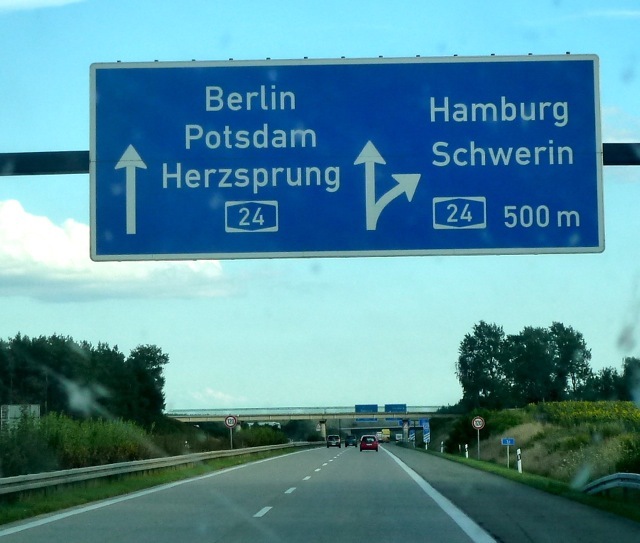 In fact, everywhere in Berlin is cheap, especially compared to Finland and Sweden. 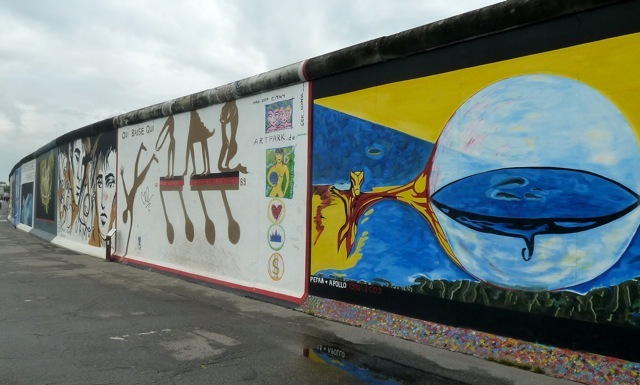 We rode a bus toward the Ostbahnhof, where we walked along the East Side Gallery, the famously well-preserved section of the Berlin Wall decorated with many artists' paintings. 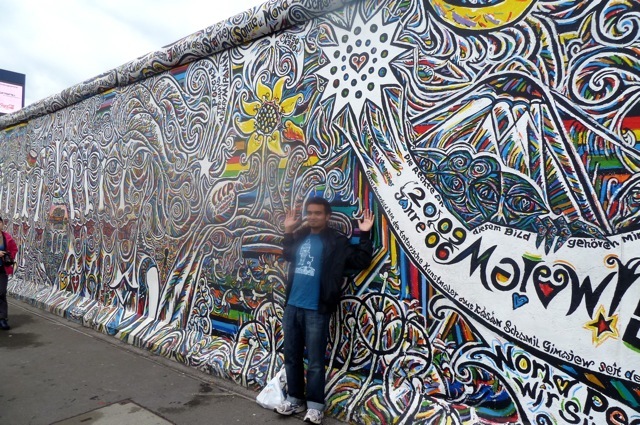 This was one of the iconic landmarks of Berlin that I didn't when I was here 7 years ago. We returned home and rested for a bit before we had some dinner with Felix's brother at the nearby cafe. 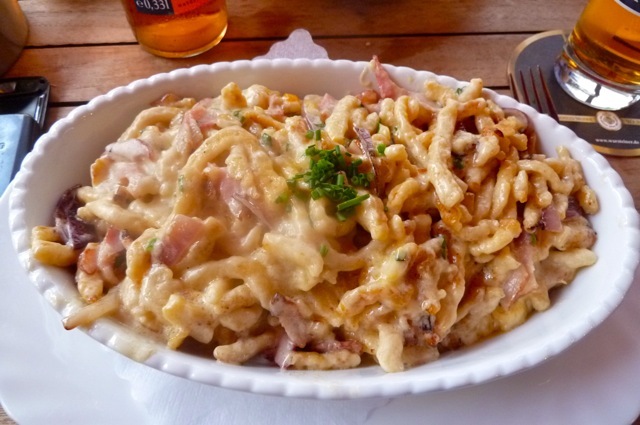 We each ate Käsespätzle, which is a German dish of small egg noodle thingies covered with cheese and deliciousness. Later, I left to meet Stephanie near her place in Prenzlauer Berg. Her friend Lydia joined us as we went to the bar, Soupanova, where there was a big CS gathering going on. However, I didn't really want to meet any more people and instead wanted to catch up with my friends. Lydia left to go to Johannes's place, where he was celebrating his birthday. Felix joined us later and we told him about the hilariously confused American girl that we met and who walked around funnily.